Conway Corp has named Kevin Watson of Watson Homes and Tom Watson of Tom Watson Construction the 2018 Energy Smart Builders of the Year for their dedication to building energy-efficient homes in the Conway community. Conway Corp recognized 25 homes built by Watson Homes and Tom Watson Construction as being Energy Smart in 2018. The builders have nine Energy Smart homes under construction, including seven in the Robynmar Subdivision, a 45 lot development being built exclusively by Watson Homes and Tom Watson Construction. 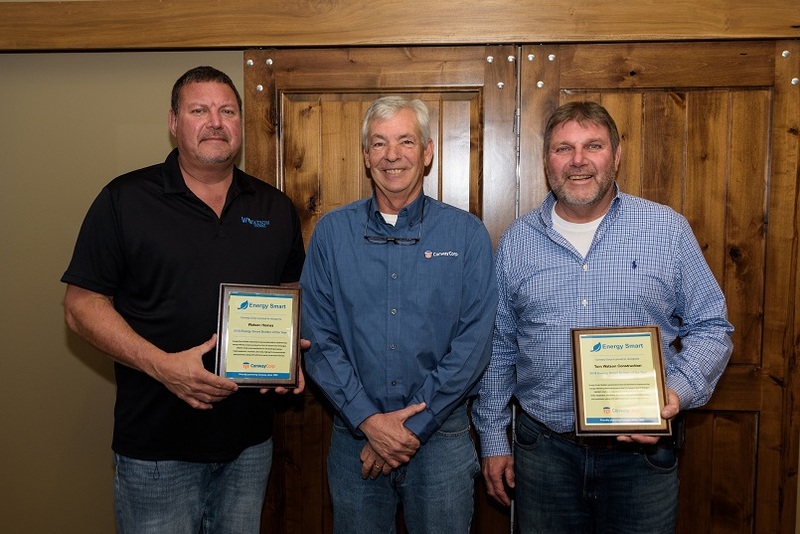 “Kevin and Tom have been committed to building homes that meet or exceed Conway Corp Energy Smart criteria since the Energy Smart New Home program was developed in 2009,” Conway Corp Major Accounts and Energy Efficiency Manager David Avra said. “910 Energy Smart homes have been built since the program began in 2009 with an estimated accumulative energy savings to the homeowners of $1,102,100,” Avra said. Customers interested in learning more about Energy Smart homes or builders interested in building Energy Smart homes can visit ConwayCorp.com/EnergySmart. Conway Corp Major Accounts and Energy Efficient Manager David Avra recently awarded Conway Corp’s Energy Smart 2018 Builder of Year honors to Watson Homes and Tom Watson Construction for their dedication to building energy-efficient homes in the Conway community. Participating in the presentation were Kevin Watson, Watson Homes; David Avra; and Tom Watson, Tom Watson Construction.